151). What is the use of Auto lock Box? Auto Lockbox (or Lockbox) is a service that commercial banks offer corporate customers to enable them to outsource their accounts receivable payment processing. 152). Auto Lockbox is a three-step process, what are those? 153). What is the order in which Autolock box searches for the types of the matching number? 155) . What are validations to be done in Journal Import interface? 156) What subclass in forms6i ? Specifies module, storage & name information about the source object and source module for a referenced objects. 157) What is the clause in SQL * Loader to program to override data into table? 158). 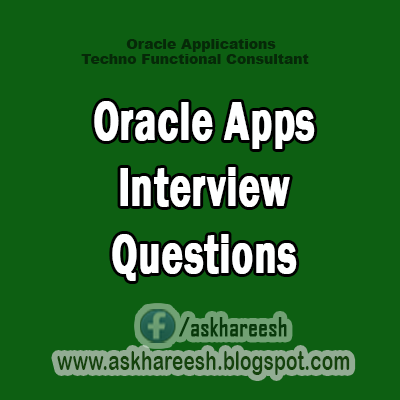 How do you set profile in oracle applications In Application Developer responsibility? 159). What is the syntax for loading data through SQL * Loader from multiple files simultaneously? 160) What is the table name for items in Oracle Inventory? 161). Tell me names of important production tables & their purpose AP, AR, GL, PO? PO: PO_VENDORS, PO_VENDOR_SITES - For storing vendor data. 162). Name the interface tables used for the LockBox Interface? 163) Name the interface tables used for the Auto Invoice Interface? 164). Different Type of Value Sets. What is exactly Translatable independent and Translatable Dependent Value Sets (Introduced in latest version of 11i)? There are 8 types of Values Sets. parameter definitions and incompatibilities. Concurrent programs use concurrent program executables to locate the correct execution file. How to Run : * Write a execution file and place in correct directory. Establish executables in Oracle apps specify execution file and method. Call your Program (- Thu application form, from other concurrent program. I have created reports through concurrent program, load(sql*loader/pl-sql pkg-proc) the file through concurrent program.